Lenovo is an innovative brand focused on building trend-setting new PC and tablet designs. The company is the global leader in the total number of PCs shipped*. Lenovo continues to grow and develop the legendary ThinkPad brand of business PCs. These products offer today’s business user more intuitive, mobile and functional designs than ever before. Our overall experience with Amazon is nothing short of pure appreciation. With the recent acquisition of the IBM System x Server division and Motorola Mobility, Lenovo has made a clear statement that they will continue to support and deliver in the desktop, workstation and server categories. Amazon Pay has become a key contributor to the eCommerce division of Lenovo US and we look forward to a healthy future and continued growth with Amazon. During the company’s surge to the top of the industry rankings, Lenovo was the only business to maintain and improve upon steady profitability in the PC category. Lenovo pioneered the 2-in-1 PC, starting with the Yoga line of convertible laptops that fold 360 degrees – from laptop to tablet, and back again – so that customers reap the benefits of multiple devices in one. Lenovo has seen sales growth after adding Amazon Pay. 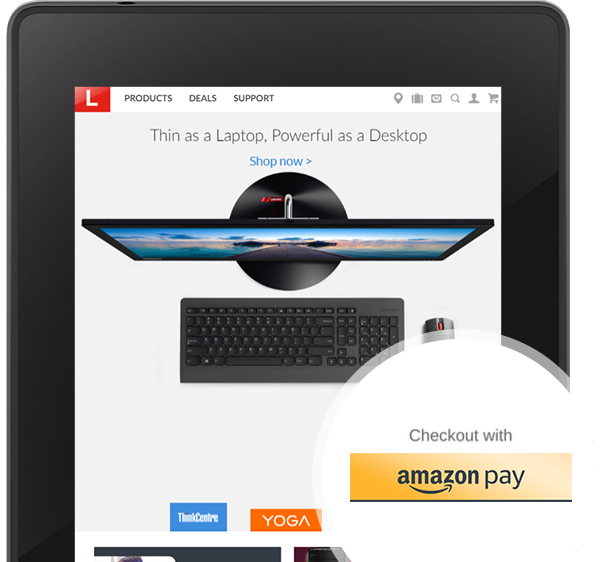 Since 2012, 10% of customers on Lenovo.com select Amazon Pay at checkout. Customers are coming back, too! Each month, an average of 2,500 repeat customers select Amazon Pay to complete their purchase on Lenovo.com. “Amazon Pay has become a key contributor to the eCommerce division of Lenovo US and we look forward to a healthy future and continued growth with Amazon,” said Lewis. *Gartner Says Worldwide PC Shipments Grew 1 Percent in Fourth Quarter of 2014. (2015, January 12). Retrieved March 1, 2015, from here.